15 The people were waiting expectantly and were all wondering in their hearts if John might possibly be the Messiah. 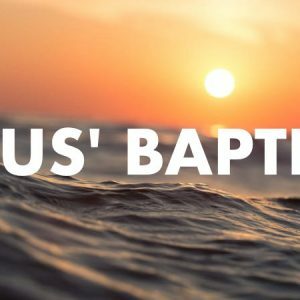 16 John answered them all, “I baptize you with[b] water. But one who is more powerful than I will come, the straps of whose sandals I am not worthy to untie. He will baptize you with[c] the Holy Spirit and fire.17 His winnowing fork is in his hand to clear his threshing floor and to gather the wheat into his barn, but he will burn up the chaff with unquenchable fire.” 18 And with many other words John exhorted the people and proclaimed the good news to them.